A handsome, commemorative edition of Peter F. Drucker’s timeless classic work on leadership and management, with a foreword by Jim Collins.What makes an effective executive?For decades, Peter F. Drucker was widely regarded as "the dean of this country’s business and management philosophers" (Wall Street Journal). In this concise and brilliant work, he looks to the most influential position in management—the executive. The measure of the executive, Drucker reminds us, is the ability to "get the right things done." This usually involves doing what other people have overlooked as well as avoiding what is unproductive. Intelligence, imagination, and knowledge may all be wasted in an executive job without the acquired habits of mind that mold them into results.Drucker identifies five practices essential to business effectiveness that can—and must—be mastered:Managing time;Choosing what to contribute to the organization;Knowing where and how to mobilize strength for best effect;Setting the right priorities;Knitting all of them together with effective decision-makingRanging across the annals of business and government, Drucker demonstrates the distinctive skill of the executive and offers fresh insights into old and seemingly obvious business situations. “The Effective Executive” by Peter F. Drucker is a great book for gaining insight into leadership from a man who was considered, according to the Author Bio on the back jacket, to be “the most influential management thinker ever.” In this book, he gives information to the “knowledge worker” about why time is so unmanageable, how to be productive, and how to make decisions, among other things. One particular area I loved reading spoke about how to have an effective meeting, as meetings are one of the biggest time-wasters for executives. Mr. Drucker warned about meetings that have no clear agenda and give no real information. He also wrote of meetings that are too short to accomplish anything meaningful and ineffective meetings that spawn “follow-up” meetings, which are, of course, an even bigger waste of time. One of the draw backs of the book is Mr. Drucker’s writing style. It took me reading and re-reading several passages before the full impact took hold. Take, for example, the passage, “One can indeed never be sure what the knowledge worker thinks – and yet thinking is his specific work; it is his doing.” – p. 4. 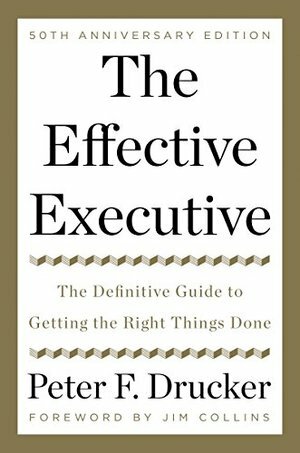 Another passage, “The more an executive focuses on upward contribution, the more will he require fairly big continuous chunks of time.” – p. 111, reminds me of Yoda speaking to Luke Skywalker. All-in-all, I found the knowledge shared in this book to be extremely relevant to the work I do and how I think about my own leadership style. I highly recommend reading it if you are looking to enhance your leadership skills, or if you’re a Star Wars fan.